How to Add New Supplier; New Supplier;Supplier Module;Supplier Record - Barcode inventory control software for user-friendly business inventory management. Includes accounting, billing, CRM and MIS reporting for complete business management. - HiTech Pharmaceutical SSAM (Accounting Software for Medical Billing), Business Management and Accounting Software for pharmaceutical Dealers, Medical Stores. Modules :Customers, Suppliers, Products, Sales, Purchase, Accounts & Utilities. Free Trial Download. Hospital Supplier Accounting Software, Medical Shop Management Software, Billing, Invoicing, Inventory Control and Accounting Software for Medicine Dealers, Stockists, Medical Stores, hospital suppliers. Modules :Customers, Suppliers, Products, Sales, Purchase, Accounts & Utilities. Free Trial Download. To add new supplier give Menu Command Supplier Record. A window will be displayed for Supplier Record Entry. The various details about the supplier like Name, Address etc. can be typed in the text boxes which are labelled accordingly. These data fields or text boxes are bound to the Data Control linked to supplier information database. As you will click one of the four buttons on the data control you will see the text displayed in the bound text boxes change accordingly. To add new supplier press command button Add Record. The various data field of the supplier record will become empty so that you can enter a new record and heading of this command button will be changed to Update Record . All other command buttons will be disabled untill you press the button Update Record after entering new record. A new unique code will be selected and be displayed in the Code field. Code should be unique and it must be given. Giving No code will not be allowed. However, codes are optional to use, if you don't intend to use codes then let the computer decide the codes for you automatically. The name should be unique. No two same names of the suppliers are allowed because the name will be used to open ledger account of the supplier and all account names should be unique. If the supplier name which you entered now already exists either in supplier record or customer record or exists as account head a message will be displayed. Change the names to unique / different names if they do not correspond to the same party. The next few lines are for entering the address. A long address can be given in two address lines. Enter city in the text box labeled City and Pin Code in the box labeled Pin Code. Various other details about the supplier like CST No. / VAT No. can also be given. Credit Limit is the maximum credit allowed to the supplier and Due Days are the number of days which are allowed to the supplier for payment of credit bills. This information is required for invoicing. When you have finished entering the record press command button Update Record . It will be again changed to Add Record . To save your record automatically Tick check box Save All Changes Automatically. If you have not done so you will get following messages : "Do You Want to Save the Current Record ?". If you want to save the record then answer Yes to the above message. To add another record again press command button Add Record. and follow the above steps. To close supplier record press command button Close. An attempt to close the supplier record or to move to new record when the text boxes are all empty (null values) will not be allowed. To come out of it move the data control to a new record and close. 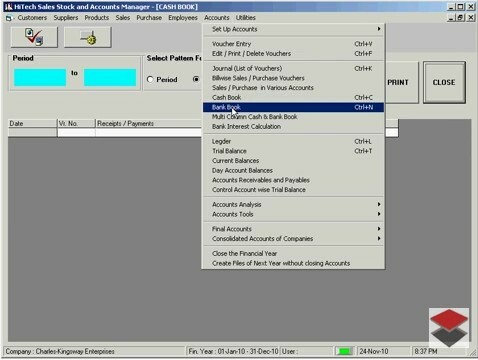 How to Add New Supplier; New Supplier;Supplier Module;Supplier Record - Billing or Invoicing, POS, Inventory Control, Accounting Software with CRM for Traders, Dealers, Stockists etc. Modules: Customers, Suppliers, Products / Inventory, Sales, Purchase, Accounts & Utilities. Free Trial Download. - Internet Billing, Inventory Control and Accounting Software, Web based Billing, POS, Inventory Control, Accounting Software with CRM for Traders, Dealers, Stockists etc. Modules: Customers, Suppliers, Products / Inventory, Sales, Purchase, Accounts & Utilities. Free Trial Download. Hotel Management Software, Hotel Software, Accounting Software for Hotels, Billing and Accounting Software for management of Hotels, Restaurants, Motels, Guest Houses. Modules : Rooms, Visitors, Restaurant, Payroll, Accounts & Utilities. Free Trial Download. The contact information of the supplier can be accessed using this control. This control enables you to use various standard interface in Windows OS and MS Office program namely Telephone Dialer, MS Word, Email, Excel and Notepad.